It is the second year for DDMBA/Chan Meditation Center to be invited to participate in this event. The event started at 7:00 in the morning, and there were 5 sessions in this 10-hour event. Three religion leaders would lead the prayers at each session. 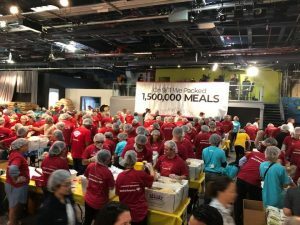 1,500,000 meals will be packed and sent to the starving areas to combat hunger. 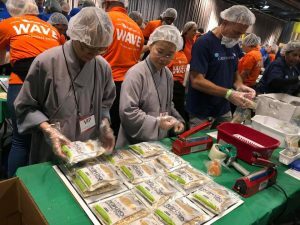 At 11:00 am, dharma teachers and volunteers from the Chan Meditation Center attended together, to participate in the 3rd session of prayer, and Meal Pack for NYC. The 3rd session of the prayer started at 12:00 pm. 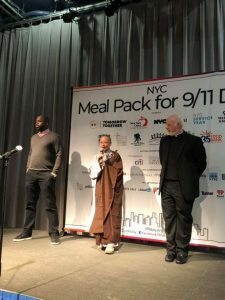 In a solemn atmosphere, three religion leaders appeared on the stage, prayed and blessed in their ways for the victims in 9/11 Terrorist Attack. Venerable Chang Zhai, from Chan Meditation Center, prepared a concise instruction for everyone: In our world, whether we know each other or not, we are connected with each other. In Buddhism, there is a well-known Bodhisattva called Avalokiteśvara (Kuan-yin), represents as the symbol of compassion. We encourage everyone to learn from Bodhisattva Avalokiteśvara, and try to be Bodhisattva Avalokiteśvara ourselves in daily lives. Not only we should be compassionate to our friends and we love, but also be compassionate to people we don’t know. Furthermore, even to those we hate, we still treat them with compassion. After the instruction, Venerable Chang Zhai led the chanting of the Bodhisattva’s name: “ Namo Avalokiteśvara Bodhisattva “, prayed and blessed for the sentient beings by gentle and elegant voice, then transfer the merit to all victims and their families. After prayer, the cheerful background music was on. The atmosphere was momentarily filled with relaxation and harmony. The monastics and lay people from CMC, started packing food with volunteers from different organizations. People may not meet each other before, but they were so friendly that there was no estrangement of race or religion among them. 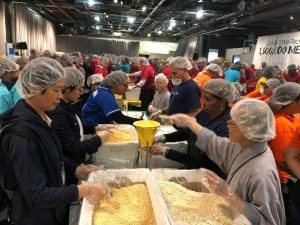 Under the guidance of well-trained volunteers with tacit cooperation, oatmeal, soy protein, dried apple, and vitamin was packed with standard specification. Everyone joined the packing should wear sterilized caps and gloves to ensure hygiene. Each food pack would be able to supply a meal for a family of four to five, and just need a quick cook with water. As we can see the carefulness and attentiveness of the sponsor from details during this event. The 3rd session of the event ended by 1:00 in the afternoon. Everyone was full of joy with the plenteous fruits of labor, and gave best wishes to each other, turning a day of tragedy into a day of doing good and serving all beings. Hope those meal packs bring our wishes and joy to the people in need. Wish world peace, and sentient beings get rid of suffering.